Starting November 1, all of AdaptiBar’s current users (except FYLSE Baby Bar students) will have the opportunity to preview and use the beta version of our new website, AdaptiBar 2.0! AdaptiBar 2.0 will operate in beta, side by side with the original site, for the remainder of the current February 2018 Bar Exam Session. This means that users can choose to use the new or original site. After logging in, users can activate the new site by clicking the button in the top right-hand corner of the screen that reads GO TO BETA. Users can switch back and forth at any time from their Dashboard by clicking the GO TO CLASSIC button in the top right-hand corner. Don’t worry, all data and notes will be stored and transferred back and forth between the new and original site seamlessly. Users don’t have to use AdaptiBar 2.0 if they choose not to. However, we ask two things from our users who do decide to use the new site: (1) please bear with us as the site is still in development, and (2) please take the time to leave us feedback so that we can improve the experience. Users will be able to give feedback at any time by clicking the FEEDBACK button in the top navigation bar. We ask our users to tell us about anything they like or dislike, suggestions they’d like to see, or bugs they may encounter. Users will also have the option to rate their beta experience when they sign out or switch back to the original site. So, what’s actually new about AdaptiBar 2.0? We’ve worked hard to build our users an updated interface, that offers the least amount of distractions while presenting questions as close to a test-like environment as possible. Faster click speeds and load times will keep users working and answering questions in real time. Users can quickly gauge their overall performance and access important links right from their Dashboard. The improved Performance Over Time graph will show users their progress over the session in one quick look. 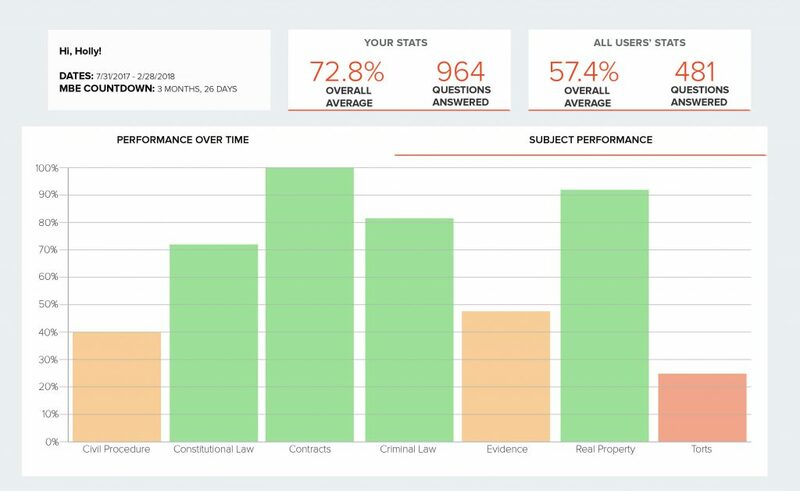 The new Subject Performance graph, also featured on the Dashboard, now has a color-coded key to help users assess their performance at a glance. Subjects that appear in red indicate performance under 40% accuracy, those in yellow from 40-70% accuracy, and those in green over a 70% accuracy. After answering questions in Practice Questions mode, users can now see a bar graph in the results section which shows all students’ answers to the same question. 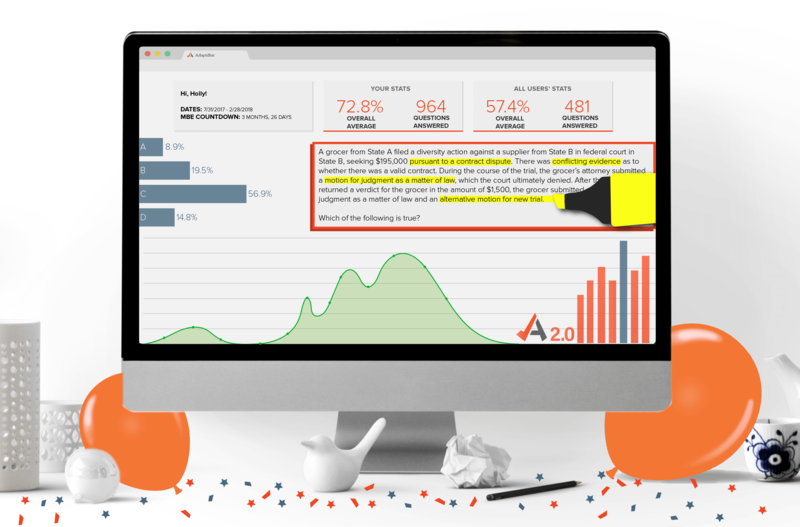 Users can quickly compare their selection and assess their performance compared to other students. 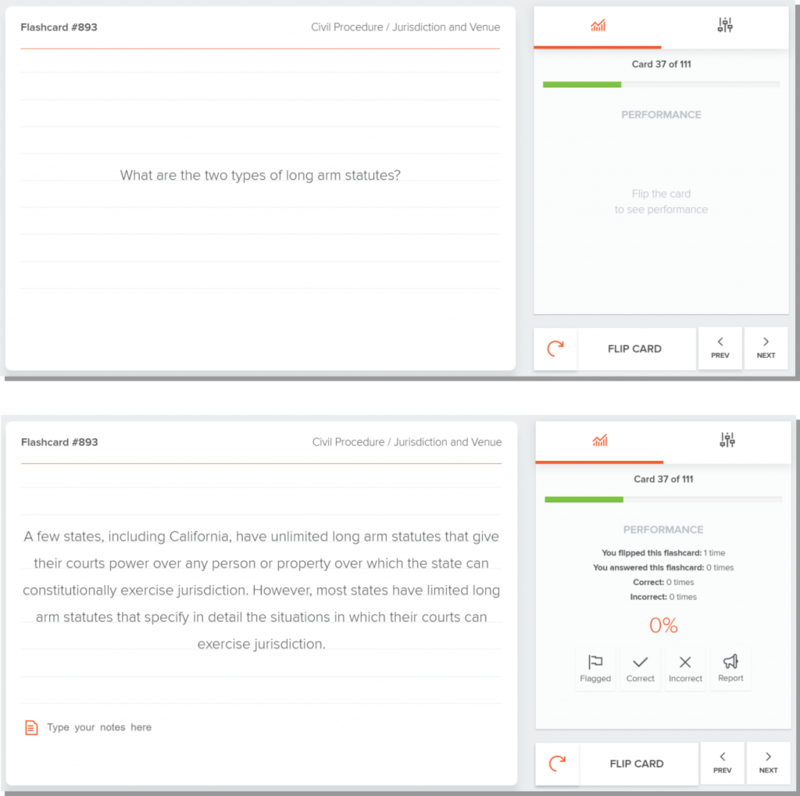 When answering questions in both Practice Questions mode and Practice Exams mode, users can strikethrough an answer choice they wish to eliminate. Users can click a small grey eye icon that appears at the end of each answer choice box when they hover over it with their mouse. Clicking the eye will put a strike through that answer choice. Simply click the eye again to remove the strikethrough. In the right-hand side panel, clicking the settings icon, also allows users to turn on text highlighting. Switch on “Enable highlight” to activate the feature. Then select any text you wish to highlight. Double click the text to remove any highlights. The new look and feel of our flashcards, helps the online flashcards look more like the hardcopy flashcards users remember making in school, with animations to show the card flip. Flashcards can now be selected by subject, subtopic, never before seen cards, or cards previously marked correct, incorrect, or flagged for review over any dates that users choose. Users now can know exactly how many cards they are selecting to view, and track their progress through their current deck as well as the whole flashcard bank. Once a user finishes the cards they have selected, they also have the option to review just the cards they marked as incorrect. In Practice Questions mode, users can select the option to “Exclude OPE Questions” before they begin answering questions. OPEs are 400 questions from the NCBE’s Online Practice Exams. Excluding OPEs will omit them from the question pool. Reserving these questions now will allow users to use them later as full practice exams without encountering repeat questions. Find the complete OPEs in Practice Exams mode under their own tab. 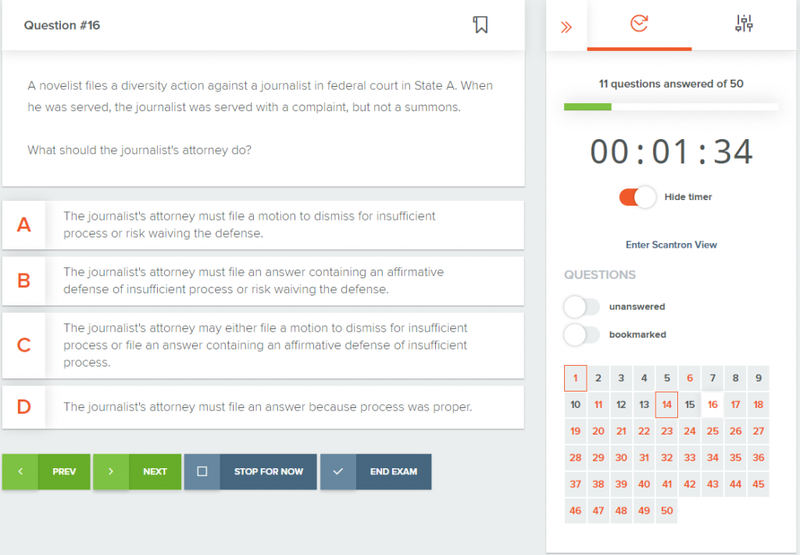 Users can now more easily show and hide timers in both Practice Questions mode and Practice Exams mode without having to stop for now and exit the question pages to adjust their settings. Users can now bookmark a question during a practice exam, as a visual reminder to circle back to the question before ending the exam. Click the bookmark icon at the top of the question to put an orange box around the question number. Users can also quickly filter the questions by “unanswered” or “bookmarked” so they never skip a question on an exam! 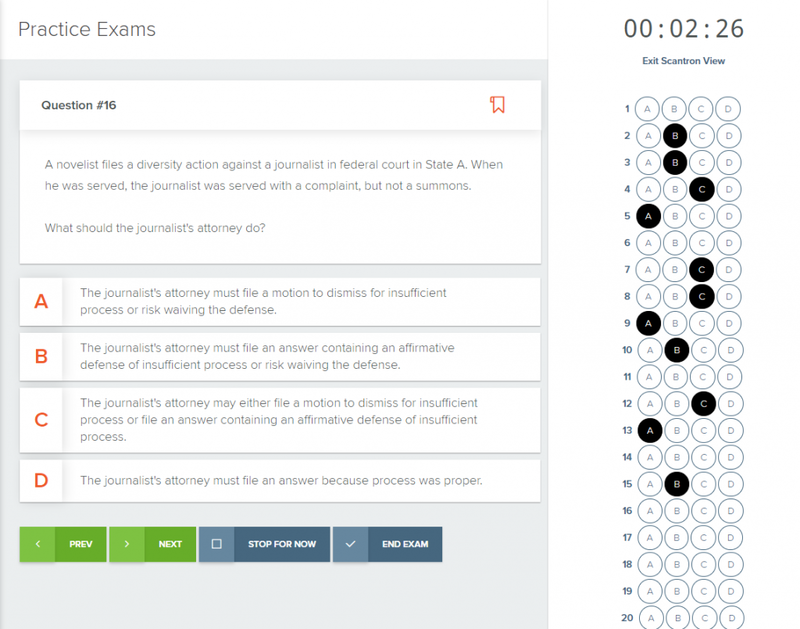 In Practice Exam mode, users can now try out “Scantron Mode” by selecting it on the right-hand side panel. This will generate an online scantron on the right side of the screen. Users can click the lettered bubble that correlates to the answer choice they want to select. This mode will help users prepare for the real MBE, done on actual scantrons. Never lose your notes again! Video notes now autosave as users type to ensure that they will never be lost. In the Messages section of the program, users can now reply directly to AdaptiBar Support by clicking the reply arrow in messages sent from us. In the Support Section, users can turn back on the AdapitBar Tour at any time by clicking “Enable” in the Tour section. This will turn back on the AdaptiBar guide which provides explanations and tips on how to use the program and new features. Stay tuned for more emails, blogs, and social media posts about updates! We plan to keep our users informed as we make important updates and add new features. We have plenty of surprises in store to roll out throughout the rest of the session!